Seems reasonable today to hear what Salam, the lone local blogger in Baghdad, has to say. He seems like a normal, intelligent guy, who says what he thinks, but he has been very courageous in sticking his neck out so publically. He supports a regime change, but he doesn't support war, and he thinks the human shields should go home. "No one inside Iraq is for war (note I said war not a change of regime), no human being in his right mind will ask you to give him the beating of his life, unless you are a member of fight club that is, and if you do hear Iraqi (in Iraq, not expat) saying 'come on bomb us' it is the exasperation and 10 years of sanctions and hardship talking. There is no person inside Iraq (and this is a bold, blinking and underlined inside) who will be jumping up and down asking for the bombs to drop. We are not suicidal you know, not all of us in any case. I think that the coming war is not justified (and it is very near now, we hear the war drums loud and clear if you don’t then take those earplugs off!). The excuses for it have been stretched to their limits they will almost snap. A decision has been made sometime ago that 'regime change' in Baghdad is needed and excuses for the forceful change have to be made. I do think war could have been avoided, not by running back and forth the last two months, that’s silly. But the whole issue of Iraq should have been dealt with differently since the first day after GW I. The entities that call themselves 'the international community' should have assumed their responsibilities a long time ago, should have thought about what the sanctions they have imposed really meant, should have looked at reports about weapons and human rights abuses a long time before having them thrown in their faces as excuses for war five minutes before midnight. What is bringing on this rant is the question that has been bugging for days now: how could 'support democracy in Iraq' become to mean 'bomb the hell out of Iraq'? why did it end up that democracy won’t happen unless we go thru war? 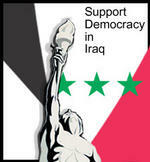 Nobody minded an un-democratic Iraq for a very long time, now people have decided to bomb us to democracy? Well, thank you! how thoughtful." there is always a need to hear the other side of the story. There is always a need to respect the right of another to speak. ALL people deserve and should expect freedom as we are ALL part of the same creation. Freedom not through war but peace without bullying interference from any nation or individual. May EVERY being on this planet be blessed with peace and understanding at this time in humanity's evolution. They do have therapists! At least, they did as of &#o#l;Mae9str0m&3039;. Dunno if they're still around. But Helo mentioned in that episode that he and Athena had made an appointment for Hera to talk to one because she was having nightmares.